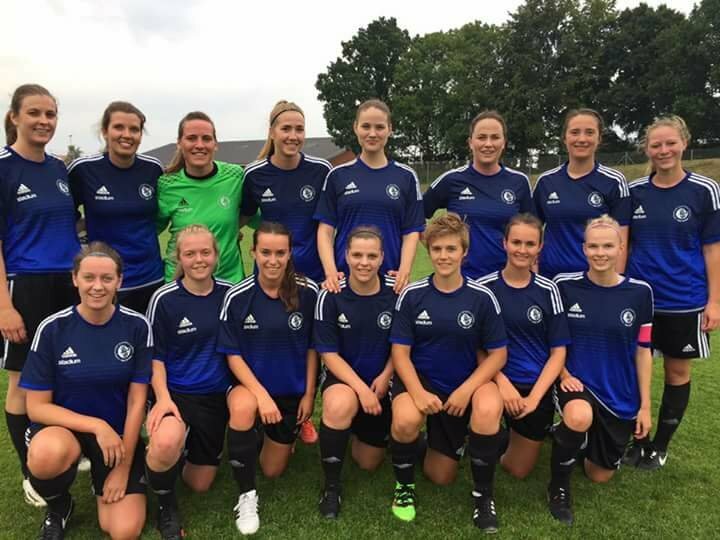 For the first time ever, the ladies of CBS Sport Football had qualified for the third round of the Cup Tournament and were scheduled to play first thing after det summer break. Skjold Birkerød – a newly promoted 1st Division team – was the opponent, and all sails were set, as there was both a referee and linesmen. Unfortunately FIU (Frederiksberg Idræts Union) couldn’t arrange a pitch meeting the standards demanded by DBU, so Birkerød offered to host the match. Thursday was a lovely sunny day and although weather reports predicted heavy rain in the evening, the pitch and surroundings looked perfect, when the teams came out to warm up. As the Cup Tournament now entered the DBU stage – besides linesmen – both teams were also asked to march in together and greet the audience in the stands, before the coin toss and wishing each other a good match. Birkerød even provided girls on the side lines ready to throw in new balls, when needed. Coach Jeppe’s line-up was the usual 4-4-1-1 with Cecilie on goal, Idunn, Telma, Benno and Skov in the defensive line, Lisa, Mia, Stone and Nika on midfield, Anna as offensive midfielder and Ólöf on top as striker. On the bench, Alberte, Caroline, Tenna and Line as extra goalkeeper was ready to come in and make a difference. Jeppe’s tactic was quite defensive, as he knew that Birkerød had played several matches already and thereby were expected to be better conditioned than CBS Sport who had played zero matches since before the summer break; with most players having only just returned to practice. The match started off with some good play from Birkerød, but nothing that was really dangerous – and they even allowed CBS Sport to move the ball forward and play on their half as well. For a while there, a 0-0 result didn’t seem that unrealistic. And then came the goal; an attack ended at the feet of a Birkerød player at the edge of the box, and despite being under pressure she brought Birkerød into the lead with a well placed shot into the opposite corner of the goal, out of reach from Cecilie. Following the goal Birkerød kept up the pressure but CBS Sport were defending well as a team, and the back line made strong recoveries the few times the organisation failed, which kept Birkerød from significant chances. Offensively CBS were struggling getting forward against a young and quick Birkerød side, with the dry and slow pitch providing a surprising obstacle for passing moves through midfield. Though CBS did have a couple of shots on goal it is quite telling that it wasn’t until late in the first half that Birkerød had their first goal kick. With under 10 minutes remaining of the first half, Birkerød made it 2-0 through an attacking move on the left wing, as a player beat two CBS defender dribbling along the touchline and scoring from a narrow angle with a powerful finish in the top of the goal at the near post. In half time, Jeppe put Alberte in for Idunn, and let the players know that he was quite pleased with the performance as a whole. Second half started out well for CBS Sport, as midfield was getting more involved and the defensive line was pushed higher than had been the case during most of first half. This only resulted in a few chances though as the lack of a striker in the lineup became evident. With 30 minutes remaining Caro came on for Anna to play up front as Ólöf was dropped back into midfield. It didn’t take long until she got a chance at goal but unfortunately the shot ended up going straight into the arms of the keeper. In the meantime Birkerød had found their way and were causing trouble once gain, as the CBS Sport defence had to make heroic saves near goal on several occasions. The third goal came, as a Birkerød corner went over Skov at the front post onto Cecilie who unfortunately was unable to react in time and deflected it into her own goal. With 20 minutes left, Tenna came on instead of Nika, to play up front, eager to use her speed. In one of her first actions she broke free from her defender but the defender managed to fight her way back and too her down in what the ref deemed a clean tackle. Tenna continued restlessly, but unfortunately without any payoff. The match ended 0-3 and CBS Sport kept their dignity intact against a higher ranked team that were closer to peak condition – one could argue that this was a quite good test match towards the new reality in Kvindeserie Øst. Stone was voted Woman of the Match, due to her restless work on the midfield, where she kept Birkerød away from a lot of counter attacks and made sure Birkerød had to work hard for every inch in midfield. Telma was the close runner-up as she thwarted many promising Birkerød attacks through interceptions, sliding tackles and blocks. Thank you to all the supporters who showed up – it was great to hear your cheers! And a special thanks to Tenna, Line and Mia for helping us out!